Eagle Hill School's Boys' Varsity Basketball Team Wins RVAL Championship! 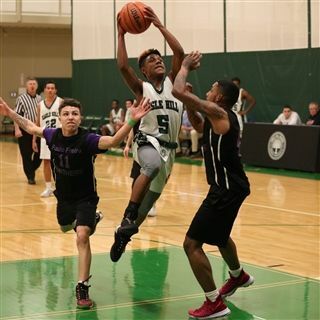 Last night, the boys' varsity basketball team beat Paulo Freire and became the RVAL champions for the first time in Eagle Hill’s history! This was the outcome they were hoping for all season long. The team’s strong play throughout the year secured home court advantage for the playoffs. With a packed house at the Baglio Center, the team was chomping at the bit to play. In the second half, Jon D. added a huge offensive boost, while 6’5” Henry S. shut down the middle defensively. Eagle Hill turned up the pressure but missed on some good looks and Paulo Freire capitalized, extending their lead to 8. Eagle Hill elected to move the ball inside and got great looks driving to the hoop rather than settling for the long three-point shots. The scoring came from many different players with Jon D., Devin P., Henry S., and George M. all scoring 8-points apiece. Kevin M. added another 6 to his 8 first-half points, and Kendall T. picked up more points despite battling an illness. Halfway through the second half, Matt S. came in to play strong defense on the perimeter shutting Paolo Freire down from the outside. The back and forth action continued, with the lead changing hands over and over. With under 4-minutes left in the game, Paulo Freire knocked down a 3 to tie the game 62 -62. After a timeout, Eagle Hill came out pressing, pressuring Paolo Freire into mistakes and capitalized with a 12-0 run of their own. It would be the difference in the game, as the Pioneers held on for a 74-62 victory. Congratulations to the team for a very well rounded game. Each and every player contributed positively in so many ways. It was a resounding victory for the boys, and perhaps the biggest win in Eagle Hill’s basketball history! Follow our EHS Facebook page for more photos and video from the game.